Throughout history, the Sicilian population has been besieged by foreign invaders and as a result, trust no-one except their own families… and even that’s a little shaky at times. Robert De Niro discovered this when he toured the island in preparation for his role as the young Vito Corleone in The Godfather – Part II – a role that required him to speak fluent Sicilian, be indoctrinated into the system of ‘favores’ or favours, and to eventually assume patriarchal control over the area of New York known as Little Italy. And all this in the mighty shadow of Marlon Brando, who had just won a Best Actor Oscar for his performance as the older Vito in The Godfather. De Niro more than acquitted himself of the task, taking home his own gold statuette for Best Supporting Actor in 1974. The three-and-a-half hour long film won another five gongs, breaking its predecessor’s Oscar count by three and placing it right up there beside it as a cinematic masterpiece. The film plays across time, starting at the turn of last century and flashing backwards and forwards between the late 1950s and the early 1920’s. 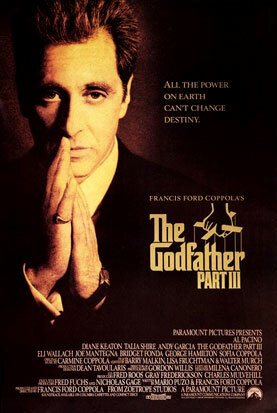 Director Francis Ford Coppola’s ambition was to show the rise of the Corleone family through Vito’s story while simultaneously revealing its demise under the stewardship of his son Michael (an incomparable Al Pacino). In Part III , released a full sixteen years later, Coppola and his co-writer Mario Puzo (author of the original novel on which the films are based) reveal a new, colder, more alienated Michael. He is now a man seeking redemption by aligning himself with the Catholic church and writing them cheques worth hundreds of millions of dollars. But can money buy legitimacy, or indeed, happiness? This is the big question posed as Michael is unwittingly sucked back into the bloody thrall of the mafia. It is Andy Garcia as Michael’s tough-nosed nephew Vincenzo who rises up through the mayhem as the next Godfather, condoned by Michael only after he swears off his cousin, Michael’s daughter, Mary. Coppola’s own daughter Sofia stepped into this role at the eleventh hour after Winona Ryder bowed out due to an illness and her performance is the weak link. But it’s a wonderful, if somewhat shattering experience watching these two movies back to back, and a testament to their artistry that they make you want to revisit the first all over again.